The name for emeralds, derived from the Greek meaning â€œgreen gem,â€� appears in a primary hue of green with secondary hues of yellow and blue. Medium and dark toned green gems are the only ones considered emeralds; light toned gems are classified as beryl. Emeralds and emerald jewelry have been treasured since the beginning of recorded history. The first mention of emerald mines comes thousands of years ago, near Cairo, with the Cleopatra mines, named after the Queen because of her love of emerald necklaces. However, the mines were in operation long before Cleopatra. 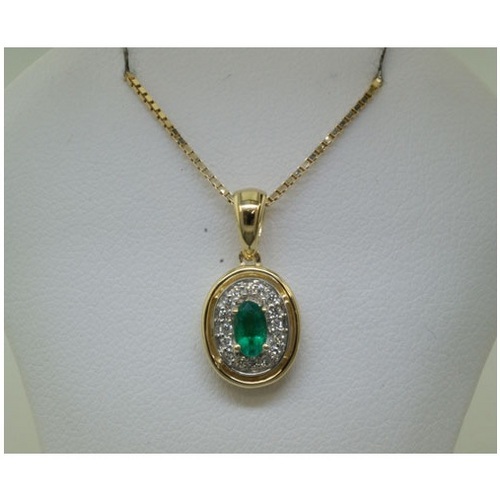 The Ancient Greeks believed that wearing emerald jewelry helped an orator give a more convincing speech. And the emerald soon became associated with Aphrodite, the goddess of love. Fast forward to the twentieth century and a different class of goddess was wearing emerald jewelry, the Hollywood elite. Marlene Dietrich was never without her emerald bracelets. And Elizabeth Taylor often donned emerald necklaces and emerald rings. And the Hollywood darlings of todayâ€™s generation are discovering emerald jewelry for themselves as evidenced by the last few yearsâ€™ Oscar award shows. As May's birthstone, emerald jewelry can be given to anyone with a May birthday. But, as Aphrodite's gem, it is also a gem associated with love, and therefore emerald jewelry is the perfect gift for any loved one.